Bhashantek Government college arranged a function to observed the 99th birthday of Sheikh Mujibur Rahman and national children’s day. The function was held in the college campus and principal of the college Professor Mahmuda Khatun was the chief guest where Md. Habibur Rahman Bhuiya played the role of addresser. Abdullah Al Mohan, asst. professor of Political science, recited an essay titling “From Khoka to Sheikh Mujibur Rahman : From Bangabandhu to Father of the nation”. He had tried to portray the ways and the political views of Khoka, Sheikh Mujibur Rahman. It detours the process of becoming the “Father of Nation” from Bangabandhu. Influential events in the Bangabandhu's life had been mentioned along with role of the world leader as a normal person to the statesman. 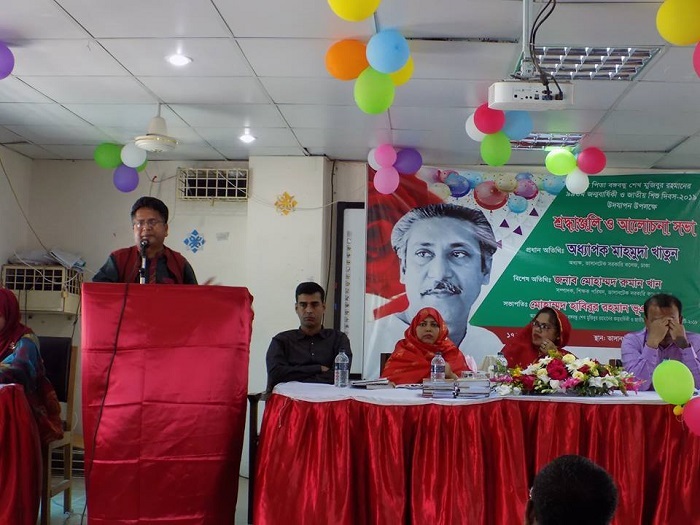 Students and other teachers had also taken part in the discussion and recitation about the life of Bangabandhu. The day end with announcing the name of winners and giving books as prize in poem recitation and essay competition.